Art Deco is one period designers return to again and again for inspiration. From literal renditions of the era to elaborate riffs on that theme, the lines, colors and textures that defined the style, projects all over the world are putting a 21st-century spin on it. 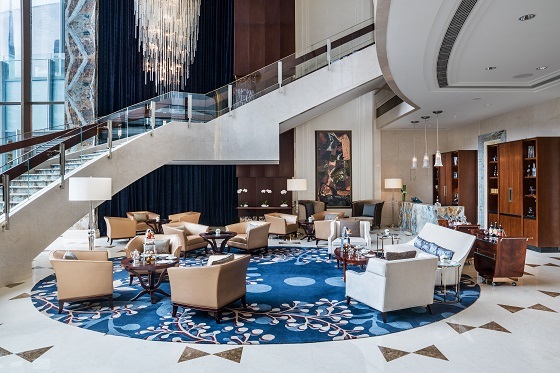 DiLeonardo, though, realized that looking back was just one part of their vision for the St. Regis Chengdu. The sweeping lines were a great starting point for the architecture and design of the 279-key property. The use of texture and pattern echo the rich visual layering of the early 20th century. Layers of color and texture enrich the space. But, they also wanted to pull in more modern elements to suit the building’s contemporary glass façade. An outsize bronze accent piece in the lobby draws the eye. An airy palette gives the guestrooms a fresh feel. So, instead of becoming a time capsule, the experience is simply timeless.